Photo Illustration by Craig Sunter. It took me years to really learn what that piece of advice means. I am naturally a slow person when it comes to processing my thoughts and feelings. I really have to chew out the flavor of a situation, steep in it, and check back after a few hours to see what the combination of my personal needs and the external context yield: what sort of soup I’m simmering. I have often times, more in my younger years than recently, made hasty decisions based on a sense of urgency. And there are times when quick decisions need to be made, but most often, the sense of urgency is false. It is more about my strong desire to have knowledge, to feel safe, to be in control, and to create a sense of completion around the problem at hand. I want instant gratification. I don’t identify that as an idiosyncratic trait, either. I think many people enjoy instant gratification. The only problem with instant gratification is that it doesn’t really open up space to explore how we feel or what we think with depth. Instant gratification usually occurs in the shallow end of the psychic pool. Time is an enigmatic condition of human existence. Western Society has probably only been more aware of its inherent mystery in the 20th century with Einstein’s Theory of Relativity and the birth of Quantum Physics. People like Martin Heidegger and Alan Watts have explored the hypothesized illusion of time through their own in-depth explorations of Eastern philosophy and religion. The most popular contemporary theory is that time is fluid, and most likely a product of our perception. 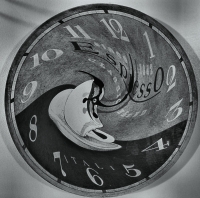 Still, we experience time as a fixed, linear state. Other than what it feels like to be dreaming, how fast time seems to move when we sleep—almost as if there is a true tesseract, or “Wrinkle in Time” as Madeline L’Engle called it, or perhaps how time flies when we’re having fun but crawls when we’re at a bothersome or obligatory task, time is measured and endured. Time gives us a finite sense. Because we can measure it, we feel as if there’s not enough. In this manifestation of being, sometimes there isn’t. We have to be mindful of other people’s needs, or very real circumstances of nature when we regard time. Still, there is occasionally more time than we realize. It really is about how we choose to spend it. Next time you hit a brick wall and feel that sense of urgency, try checking in with your sense of time and the reality around how much you have. Then try giving yourself some time. Perhaps you will even find that time will bring another aspect of the situation you’re in to you. The span of time does tend to unfold its petals outward in a radial manner the way roses do. We see things that were previously folded away from our vision. Regardless, make friends with time. Be with it. Even if it’s a chronic “pain in the backside” issue you have to deal with, at minimum you can be assured that if you are benevolent with yourself, the anxiety will pass and you will meet the next moment, and moment, and moment again with readiness and steadiness. Don’t worry. You have time.